Here are some of the best specials, deals and vacation packages in Chicago, whether you want an affordable room for a few nights, a romantic package for two, or an ultra luxe rock star package. Remember to ask about AAA Member discounts, student and senior offers which are often available. The Radisson Blu Aqua hotel is a newly renovated hotel in Chicago. They are offering the Kids Camping Package which includes accommodations for two adults and two children. Breakfast is served each morning for two adults and children also receive a special kid’s breakfast at Filini Restaurant. The package includes a tent that children can use in-room and take home along with their Radisson Blu Bear and coloring book. The package offers complimentary access to the indoor lap pool and the children's splash pool. Included is a welcome snack of cookies and milk and children will love the S'mores kit they receive upon arrival. Rates start from $279. Kinzie Hotel is a charming retreat in the River North district of Chicago, Illinois. A popular destination for its appealing food venues, guests can indulge in Michelin rated restaurants, explore underground speakeasies or sky lounges. Kinzie Hotel offers the Chicago Foodie Package that guides guests to the best spots on the foodie map. The package offers 10% off the best available rate, complimentary continental breakfast and a $50 American Express gift card. Included is also a Chicago foodie map, Garrett popcorn and an Eataly welcome amenity. The package offers the Evening Manager's Reception with complimentary hors d'oeuvres and one complimentary drink per night per guest. The InterContinental Chicago is a luxurious hotel that leads to the famous Magnificent Mile. Guests will enjoy amenities like the indoor heated pool, a fitness center that spans three levels, spa and the luxurious ambiance. The hotel is offering the Family Fun Package. The package includes a complimentary in-room movie and Garrett popcorn for the whole family. Enjoy some family time with the complimentary deck of playing cards. Also included is two Michael Jordan's Steak House Baseball hats and the use of a Wii console in the room. Lang House Bed and Breakfast is a tranquil inn in Chicago. The Chocolate & Relaxation Package is offered to guests to make the stay at Lang House more memorable. A special arrangement of quality chocolates and other accompaniments are placed in the room to welcome guests. Personal care is taken for any dietary requests or brand preference of the guests. The guest rooms have heated floors in the private bath and their luxurious linens are sure to make the stay comfortable. They serve a continental breakfast that is delicious and highlights the freshly baked local produce. ACME Hotel is conveniently located in downtown Chicago close to the Magnificent Mile. They are offering the 'I've Got Baggage' shopping package. The package is a perfect way to have a fun girlfriend's getaway, included is a spacious guest room and discount shopping coupons. The package also includes overnight accommodations and two bottles of complimentary water. Guests receive one $50 'Give Style' gift card to The Shops at North Bridge on Magnificent Mile. Included is a complimentary shopping and dining visitor rewards brochure for The Shops at North Bridge. The rates start at $109. W Chicago towers over Lake Michigan in Chicago. It offers easy access to the Navy Pier, the city's cultural district and downtown. The Go Cubs Go Package offered by the hotel makes the trip to the windy city a memorable one. Included is savings up to 20% when staying over on a game day. Being the official partner of The Chicago Cubs, guests can watch the action at the historic Wrigley Field. There are limited number of rooms at these rates and the offer is not valid for groups. This package is valid all season long. Monaco is a historic downtown Chicago hotel that is part of Chicago's historic Loop. This early 20th century building was once a hat factory and guests can see the décor reflects its history. The hotel is offering the Breakfast on the River Package. Guests can enjoy daily breakfast for two at the scenic South Water Kitchen. The South Water market district is the location that Chicago receives and distributes fresh produce, the South Water Kitchen pays tribute to this heritage by only serving seasonal and farm fresh ingredients. The Hard Rock Hotel Chicago is a contemporary hotel in Chicago. It is located close to the Magnificent Mile and offers easy access to the exciting night life. There are several options for accommodations and each offer modern and luxurious amenities at this hotel, guests can pick either a traditional room or a modern suite. The hotel is offering the Toast and Jam Special Package for its guests. Included in the package is a scrumptious breakfast at Chuck's, A Kerry Simon Kitchen. Guests save on their daily breakfast charge with this package. Hotel Indigo is a boutique hotel in Chicago that offers local experiences with a modern ambiance. The local artwork gives character to the hotel, the suites at this hotel offer spectacular views of Lake Michigan and certain rooms have gas fireplaces. Guests will be impressed with the menu at the restaurant that highlights local and seasonal produce. The hotel is offering the Daily Parking Package. Guests receive accommodations in the room of their choice and included is parking of one vehicle. Rates start from $167 per night. The Talbott is a boutique hotel in downtown Chicago. It is located close to the Magnificent Mile, exciting nightlife of Rush Street, music venues, restaurants and major stadiums. The Talbott is offering the American Girl Spirit Package. The package includes a personalized welcome letter and an American Girl fold-out doll bed. Guests will receive milk and Sprinkles® cupcakes at turndown, access to the “Girl Blog @ The Talbott”, a private exclusive co-branded concierge toll free line and a single entry in the American Girl quarterly doll drawing. Palmer House is an elegant hotel with over 140 years of award winning service in the hospitality industry. Located in the Theater District, this hotel is close to Millennium Park and the Art Institute. Guests will be impressed with its frescoes and exclusive dining at Lockwood and Potter's Lounge. Palmer House is offering the Breakfast & Wi-Fi Package. After a good night's rest, guests can enjoy a leisure breakfast each morning with this package. Included is premium Wi-Fi that gives an opportunity to surf the web or send vacation pictures to family and friends. Langham Hotels is an exclusive getaway in Chicago. This luxurious hotel is offering the Chuan Spa Journey. This package offers a daily $100 Chuan Spa credit that can be used towards any treatment. The bathing amenities include an Herbal Sauna, Himalayan Salt Sauna and an Oriental Steam Room. Included in the package is access to the fitness studio, the pool and complimentary Internet access. Guests can enjoy complimentary in-room tea and Nespresso coffee with the daily local newspaper. Included is also eligibility to earn airline miles. Taxes extra. Sofitel Chicago Water Tower is a luxurious hotel in Downtown Chicago. It is conveniently located close to Miracle Mile and Millennium Park. With amenities like a fitness center, ballroom, business center, library and an international restaurant that serves authentic cuisine, guests will have a memorable stay. This hotel is offering the Magnifique Family Package. This package offers a discount of 50% off the cost of the children's room when guests book two rooms. Guests have a choice of accommodations, most of the rooms have spectacular views of the city. Complimentary breakfast is included for the children and their parents and a late check-out of 4:00 pm. Waldorf Astoria Chicago is an elegant destination offering spectacular views and amenities in Chicago. Set in the prestigious Gold Coast area, guests will enjoy the opulent amenities and décor. The hotel is offering the Waldorf Astoria Spa Experience. This package offers $150 spa credit that can be claimed towards treatments at Waldorf Astoria Spa & Health Club. Included are the services of a dedicated personal concierge, spacious and luxurious accommodations and a dedicated Wi-Fi. Guests also receive access to the lap pool, DreamDry and fitness center. The Warwick Allerton Hotel is a sophisticated hotel in Chicago. The hotel offers one of the best places to eat on the Magnificent Mile, M Avenue Restaurant and Lounge. Guests have premium amenities and a 100% smoke free environment. The hotel is offering the Suite Dreams Package. This package offers overnight suite accommodations. Guests are treated to strawberries and champagne upon arrival and overnight valet parking. Included is in-room Wi-Fi and other standard amenities like in-room dining, fitness center, bar and meeting rooms. The James is a boutique hotel in Chicago. The hotel has a modern design with each room having luxurious amenities and a classic décor. The James is offering the See Art Chicago Package. This is the perfect opportunity for art enthusiasts to see the permanent collection featuring local and international artists in the city. The package offers a classic in-room American breakfast every morning for two from David Burke's Primehouse. Guests receive a self-guided walking tour that highlights cultural institutions, museums and non-profit art spaces. The package also offers two one day public transit passes. Virgin Hotel is a unique boutique hotel that is setting new standards in the hospitality service. The hotel offers personalized service with modern amenities, they make an effort to focus on the functionality of the rooms, not just how it looks. The accommodations offer two lifestyle focused rooms, custom designed bed and a mobile app to order room service or make dinner reservations. Virgin Hotels is offering the Stay a While Package. This package offers a 20% discount when guests stay 4 nights or more. Included in the package is unlimited Wi-Fi. The Gwen is a luxury hotel located on the Magnificent Mile in Chicago. It is offering the Artist-in-Residence Experience. Guests can explore their creativity by turning their room into an artist's studio. The package offers luxurious overnight accommodations, an art inspired turndown amenity and a complimentary copy of The Glen. Included are two VIP all access passes to the Art Institute of Chicago. A full-sized easel, paints, canvas and brushes are in the room and the concierge will assist in shipping the artwork back home as part of the artist-in-residence in-room set up offered during the stay. Fairmont Chicago is a stylish destination in Chicago. 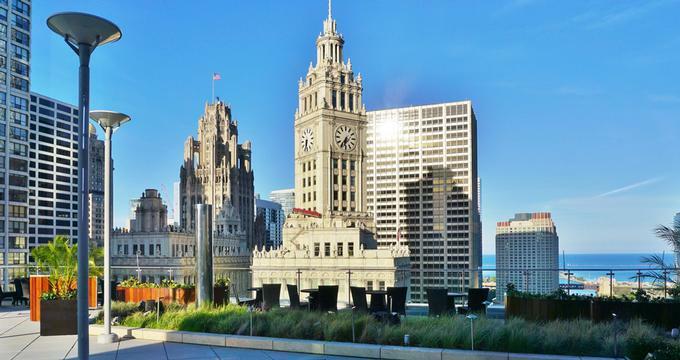 Located near Millennium Park, the hotel is close to the cultural hotspots and the impressive nightlife. The hotel offers easy access to one of the best destination for shopping, the Magnificent Mile. Fairmont Chicago is offering the Shopping Package, guests can visit Saks Fifth Avenue and Michigan Avenue for a shopping excursion. The package offers overnight accommodations and a $100 Saks Fifth Avenue gift card. Rates start from $239 per room, per night. Taxes and gratuity are extra.